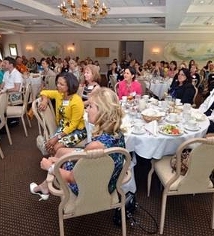 Our networking events are generally held on the fourth Wednesday of each month. On Friday, April 19th, 2017, help us make our third golf tournament a success! 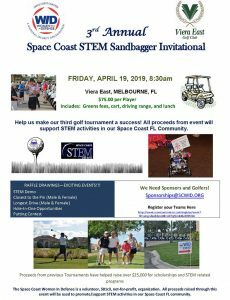 All proceeds from event will support STEM activities in our Space Coast Florida Community. On Wednesday, March 27th, 2019 we had a monthly networking meeting on writing tricks to help you build confidence and win more! Presenting was our speaker Juliet Moore, CEO of Writing is Easy. 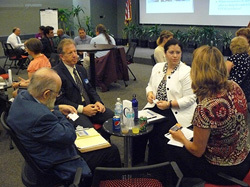 On Wednesday, February 27th, 2019 we had our latest speed networking event, sponsored by Harris. On Saturday, January 26th, 2019 we celebrated our six year anniversary and had award ceremonies for the 2018 STEM Awards. The featured speaker for the evening was Robert Jordan, President/CEO of Genesis VII. On Wednesday, October 24th, 2018 our monthly networking meeting featured speaker Bryan Lilley, President of B. Lilley Productions LLC, International Council of Air Shows. On Tuesday, August 28th, 2018 our board members held an annual retreat. On Sunday, July 29th, 2018 we helped fund next year’s STEM scholarships at our “Painting with a Purpose” event with instructor Irene. Last year, a similar event helped raise $2500! On Wednesday, June 27th, 2018 Supervisor of Elections Lori Scott spoke about the “Benefits of Building Strong Professional Networks,” and we presented our annual scholarships..
On Wednesday, April 25th, 2018 we held out Winesday and Networking Spectacular event, where guests came to share their company mission and collaborate contracting and staffing opportunities. The evening of Tuesday, February 6th, 2018 we kicked off the WiSE Symposium with a networking social and dinner featuring Retired Captain Winston Scott, a former NASA astronaut, as the Keynote Speaker. The evening of Wednesday, October 25th, 2017 we saw a presentation from the Economic Development Council The Growing Economy in Brevard and The Impact of Manufacturing. On Wednesday, September 27th, 2017 we had our monthly network meeting with a round of speed networking. 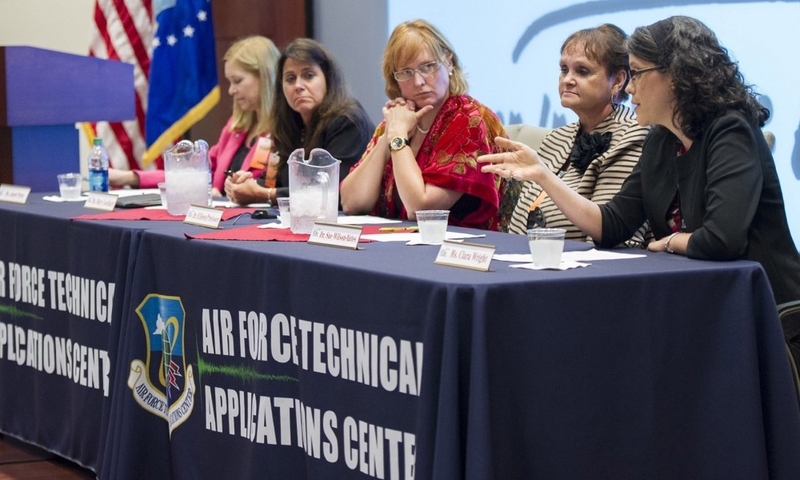 On Wednesday, August 23rd, 2017 we held a panel discussion on STEM Career Initiatives and Opportunities. On Friday, July 14th, 2017 our board members held a retreat. On Wednesday, June 28th, 2017 we saw scholarships presented to young women who demonstrate merit in the STEM disciplines who may not have the financial means to cover their educational costs. On Wednesday, May 24th, 2017 we heard about how Ability Plus Therapy and No Limits Academy revolutionize the education of students with disabilities. On Friday, April 21, 2017 we hosted our second annual Space Coast STEM Sandbaggers Invitational Golf Tournament at the Duran Golf Club, Viera FL. 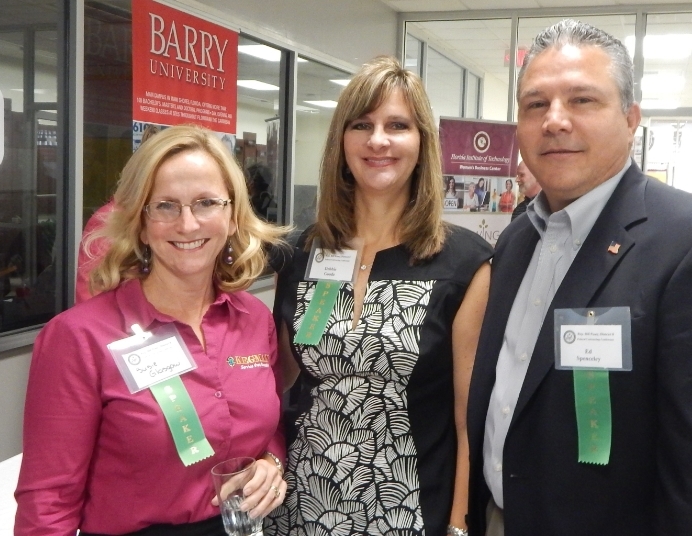 The main purpose of this event was to raise funds for Brevard County STEM programs. On Wednesday, February 22nd, we celebrated Black History Month, with our guest speaker Moses L. Harvin, Sr. Moses is President and CEO of American Services Technology, Inc. (ASTI) and spoke on the subject of ASTI as well as past and present black history. IHRA Jet Dragster World Champion Driver Elaine Larsen led the festivities as we celebrated our 4th anniversary this January. Proceeds from the event are used to benefit STEM initiatives in Brevard County.